Mice can be trained to poke their noses into the right opening to get a food reward. In a mouse model of fragile X syndrome, the mice have trouble adjusting to changes in the reward. Reducing PI3 kinase activity with genetic tools can restore their ability to adapt. This suggests drugs that target PI3 kinase could be similarly helpful -- maybe one day with people with fragile X syndrome. Image courtesy of Shannon Gourley. The results, published April 23 in Cell Reports, suggest that a drug strategy targeting a form of the enzyme PI3 (phosphoinositide-3) kinase could improve learning and behavioral flexibility in people with fragile X syndrome. The PI3 kinase strategy represents an alternative to one based on drugs targeting mGluR5 glutamate receptors, which have had difficulty showing benefits in clinical trials. Research led by Emory scientists Gary Bassell, PhD and Christina Gross, PhD had previously found that the p110β form of PI3 kinase is overactivated in the brain in a mouse fragile X model, and in blood cells from human patients with fragile X syndrome. Now they have shown that dialing back PI3 kinase overactivation by using genetic tools can alleviate some of the cognitive deficits and behavioral alterations observed in the mouse model. Drugs that target the p110β form of PI3 kinase are already in clinical trials for cancer. "Further progress in this direction could lead to a clinical trial in fragile X," says Bassell, who is chair of Cell Biology at Emory University School of Medicine. "The next step is to test whether this type of drug can be effective in the mouse model and in human patient cells." The first and co-corresponding author of the Cell Reports paper is Christina Gross, PhD, who was Bassell’s colleague for several years at Emory before establishing her own lab in the Division of Neurology at Cincinnati Children’s Hospital Medical Center. Gross and Bassell collaborated with neuroscientist Shannon Gourley, PhD and her lab at Yerkes National Primate Research Center, to study impaired decision-making seen in mice with a deletion of the Fmr1 gene, the mouse version of the gene that is disrupted in fragile X syndrome. 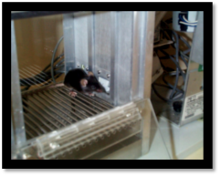 Mice can be trained to poke their noses into one of two openings to receive a food reward, but those with a deletion of the Fmr1 gene had trouble adapting to a change in the location of the reward. They also failed to stop responding when the reward was no longer available. The researchers injected a viral vector to interfere with the p110β gene in the pre-frontal cortex, a region of the brain important for complex decision-making. The viral vector restored the ability of the Fmr1 deleted mice to link reward with the correct response. It suggests that the right dose of a drug that interferes with p110β could also improve performance on a task measuring goal-directed behavior. "This could be analogous to a situation where an individual with fragile X syndrome may have behavioral inflexibility; for example, difficulty adapting to a change in routine," Bassell says. "We thought it was important to show that this acute intervention could be effective in adolescent mice, after they have grown up without the Fmr1 gene." Researchers also lowered the levels of p110β in the entire body through genetics, by breeding mice with only one functional copy of the p110β gene. This could alleviate several behavioral effects of Fmr1-deletion in the mice, including repetitive marble-burying and sensitivity to seizures triggered by loud noises, without having adverse affects on wild type mice. A companion paper from the same team, also in Cell Reports, shows that many of the same behavioral benefits can come from deleting one copy of the PIKE gene, an enhancer of PI3 kinase signaling. The PIKE paper shows that the relationship between FMRP (the protein encoded by the fragile X gene) and PI3 kinase signaling is maintained in fruit flies as well as mice. Although recent clinical trials of drugs based on mGluR5 glutamate receptors were unsuccessful, the Emory researchers’ findings do not conflict with the idea that targeting mGluR5 glutamate receptors could help in fragile X syndrome. In fact, they observed that reducing PI3K expression can correct impairments in mGlu5 signaling, Bassell says. Co-authors not mentioned above included Ken Moberg, PhD and Keqiang Ye, PhD at Emory, Jay Gibson, PhD and Kimberly Huber, PhD at University of Texas Southwestern, Thomas Jongens, PhD at University of Pennsylvania and Eric Klann, PhD at New York University. Gross and Bassell published a paper in 2012 showing that immortalized blood cells from fragile X syndrome patients have elevated levels of the p110β form of PI3 kinase. A drug that inhibits p110β can restore the regulation of protein synthesis in those cells. "This could be very useful for translational research," Gross says. "It’s a simple biochemical test we could perform on patients’ blood cells, which could predict whether they would do well on PI3 kinase-targeting drugs." Because PI3 kinase enzymes also regulate metabolic functions, side effects of drugs that inhibit them would need to be thoroughly evaluated, but recent studies indicate that toxicity could be low. No drugs that address the core molecular problems arising in fragile X syndrome are available for clinical use, although individuals with fragile X sometimes are prescribed antipsychotic or antiseizure medications. The research at Emory and Cincinnati Children’s was supported by the FRAXA Research Foundation, the Brain and Behavior Research Foundation, Autism Speaks and the National Institute for Mental health (MH103748 and MH105353).